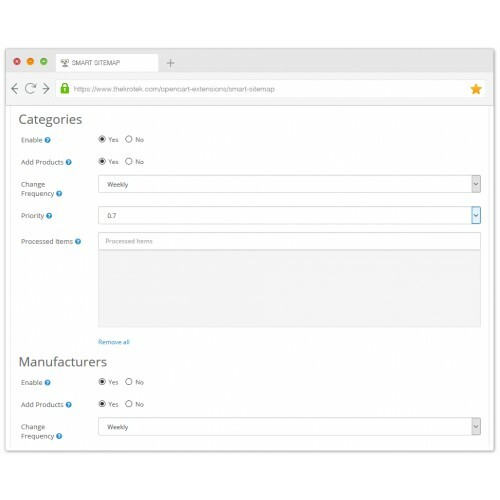 Gives you full control over sitemap, allows to select different elements (products, categories etc), set their change frequency, priority and much more. 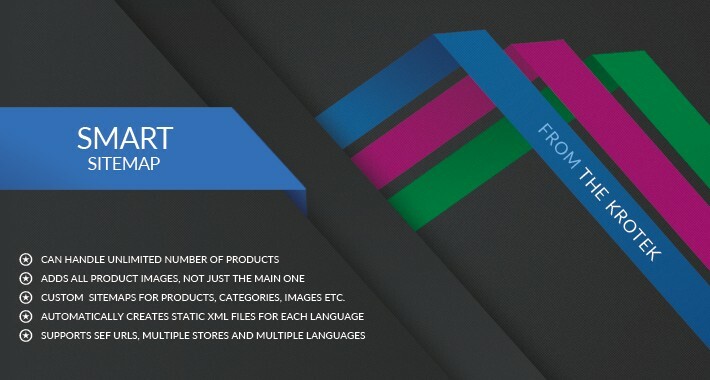 Supports multiple languages, images and unlimited number of products. Tested on 100.000+ products. ▸ Can literally handle unlimited number of products. Tested on 100000+ products with images! ▸ Adds all product images, not just the main one. Uses name (title) and description as image title and caption. ▸ Select sitemaps to create: products, categories, manufacturers, information pages or images. ▸ Automatically creates static XML files with sitemap for each language, no need to click any buttons. ▸ Supports SEF URLs, multiple stores and multiple languages, works right from the box, very easy to handle. This extension is a part of Smart SEO Pack. Get all our SEO extensions packed and save up to 50%! 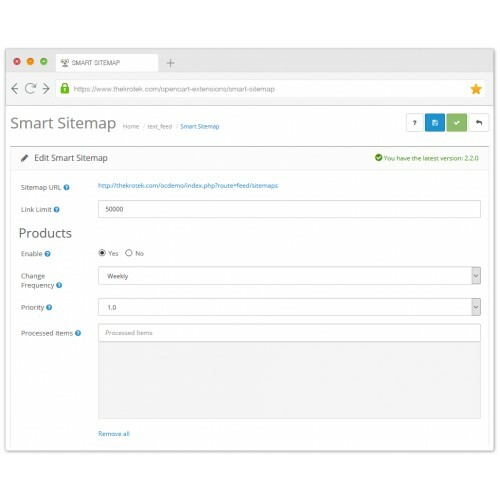 Smart Sitemap is the most sophisticated sitemap extension on the market. It uses standard XML functions, which always return properly generated XML file, acceptable by all search engines. 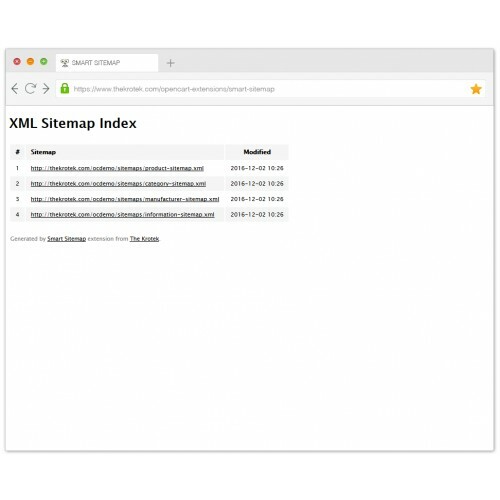 It not only allows you to select different types of sitemaps (products, categories, etc. ), but individual items as well. 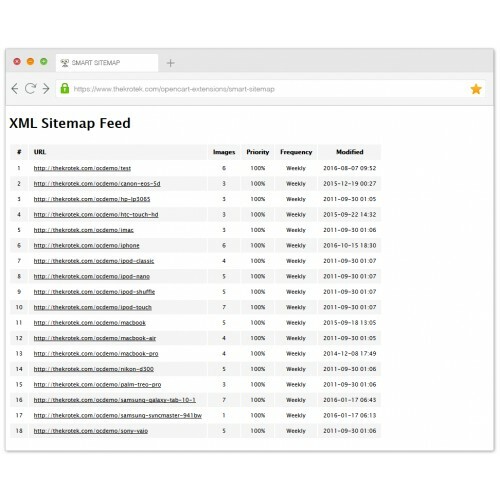 You can add only information, which you want to see in sitemap, not every possible item from your store. No other extension can do that! But the best part, it can literally handle unlimited number of products. Extension's settings can be found on the back-end of our demo site (username: demo, password: demo). Go to Extensions -> Feeds and click Edit near Smart Sitemap extension. To see the XML sitemap just click the Sitemap URL link on extension settings page. You will find documentation on extension's page. For support us via email or forum. NOTE: To install and use this extension on OpenCart 3 you must also install OpenCart 3 Compatibility Fixes. Please, read our support terms before purchase.